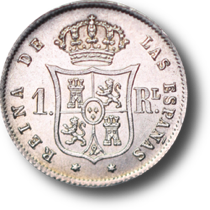 If the Spanish sought to emulate the French decimal coinage in order to supplant it with true Spanish coinage, the use of 1/10ths likely came from their observation of the French decime and 1/2 franc. 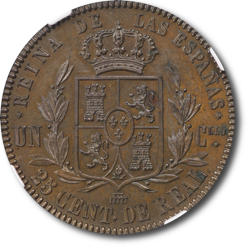 However, while the French had 1 centime coins prior to 1800, Spain's recent decimalization was based purely on tenths. Amounts of less than 5/100ths had to be rounded or old maravedís coins used. 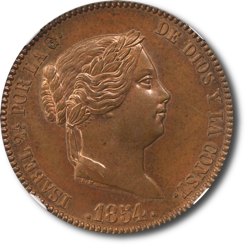 Some ministers were also concerned with the potential for counterfeiting of the recently implemented copper coins which had relatively simple designs. Additionally, the sheer volume of small change needed for commerce was immense. 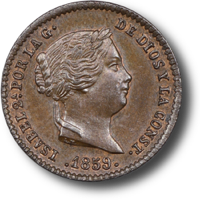 The Royal decree of 19 August 1853 replaced the 1/10 division “décima" copper coinage with 1/100 division “céntimos". The denominations of silver and gold remained the same, but copper coins were issued as 5, 10, and 25 céntimos de real. 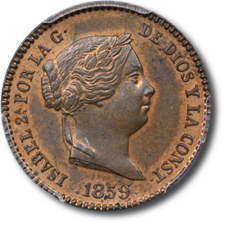 Additionally, it re-opened the mint at Jubia in an effort to dramatically increase the production of copper coin and ordered that all available obsolete copper coins (maravedís and cuartos) currently on hand in Cataluna be moved to Jubia for use in manufacturing new coins. It further required that the queen's image appear on each coin. Article 4 of the royal decree references the 1 January 1854 start date and requires approval of the queen for the coin design. 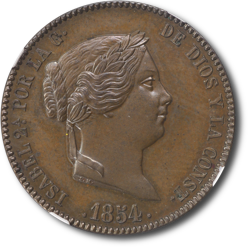 Although an 1855 decree confirmed the real and its 1/100th divisions as the unit of account, coinage denominations below five céntimos would not appear until 1865. A desperate need for small change continued to keep décimas and maravedís in circulation. After the discovery of large quantities of gold in California, the value of gold relative to silver on the world market dropped. 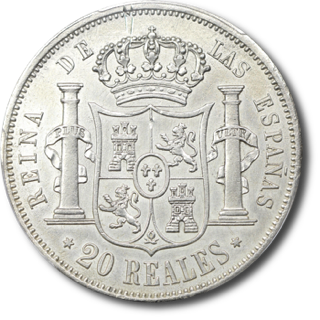 As silver 20 reales still contained more silver than other European coins of similar value, the export of 20 reales to the melting pots of Europe and elsewhere accelerated. The gold coins intended to act as a store of value were being dumped on the commercial centers and government of Spain in exchange for more valuable silver even as the value of gold dropped. 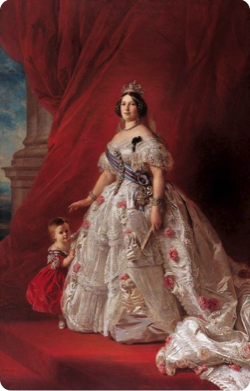 Spain's government responded by suspending the minting of gold coins in 1851. Despite this decree occuring early in 1851, gold coins of this date and 1852 were issued. 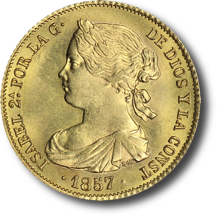 No Spanish gold coins were issued with a date of 1853. 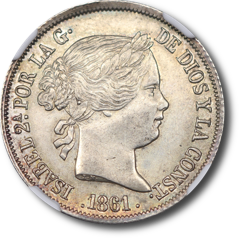 The Royal decree of 3 February 1854 restored the issuance of gold coins and again reduced the weight of the silver 20 reales. As of 1856 the "Laureate Head" and "Draped Laureate Bust" designs were henceforth used on silver and gold coins, respectively. 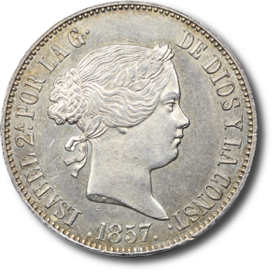 These beautiful representations of the queen make the coins of 1856-1868 among the most sought after coins of her reign. 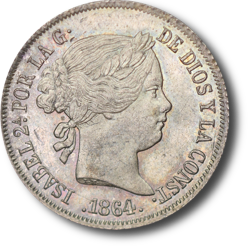 Luis Marchionni's initials "LM" appear at the base of the neck on the bust of each coin. (1) “Parte Oficial.” Gaceta de Madrid. Madrid, Spain. (24 August 1853): No. 236, page 1 (translated). (2) de Grau, Gabriel Calbeto. Compendium VIII Reales Volume II. San Juan: Ediciones Juan Ponce de Leon, 1970 (translated). Several more decrees would be issued regarding the coinage in this period, including the addition of 20 and 40 reales gold coins by decree of 31 January 1861. 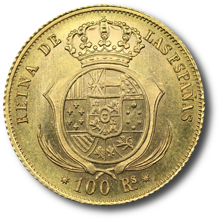 The 10 céntimos de real were of a single type issued from 1854 to 1864 and all minted at Segovia. The coin pictured here exhibits beautiful red-brown surfaces with lustrous highlights in the hair and laurel wreath. 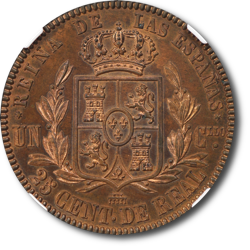 The 25 céntimos de real were of a single type issued from 1854 to 1864. In addition to Segovia, the Barcelona mint issued these in 1863 and 1864. Prior to the initial issue in 1854 several proof examples were made. The coin pictured here is one of those proof issues. It has exquisite chocolate brown surfaces and razor sharp details. Tied for finest seen by this author. The 25 céntimos de real were of a single type issued from 1854 to 1864. 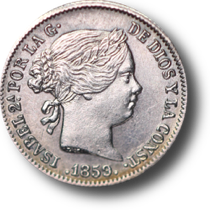 In addition to Segovia, the Barcelona mint issued these in 1863 and 1864. Prior to the initial issue in 1854 several proof examples were made. The coin pictured here is one of those proof issues. It has gorgeous red-brown surfaces with a subtle cameo appearance to the devices on the reverse. Luster shimmers over the entire surface as the coin is tilted and rolled in hand. Tied for finest seen by this author. The 4 reales of this type were issued from 1856 to 1864. 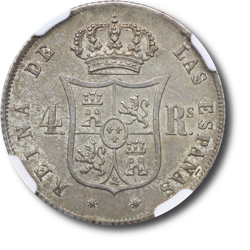 The 4 reales was also commonly referred to as a peseta. 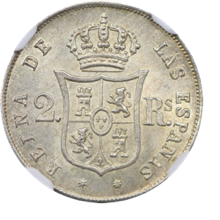 Coins of this size were among the more frequently used silver coins in Spain. 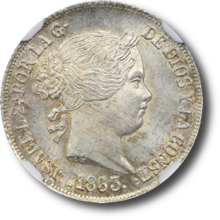 The 4 reales and later 40 centimes de escudo were workhorse coins of their day and are now challenging to find in XF condition or better. The darker areas on the obverse of this coin belie the deep, shimmering, lustrous fields and delightful colors that come to life on both obverse and reverse when examined in hand. 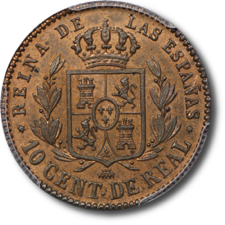 The 10 reales of this type were issued from 1857 to 1864. The coin pictured above is an attractive example of the type. Remaining luster on the bust helps it stand out from the fields, giving this 1857 10 reales coin a beautiful semi-cameo appearance amid lightly marked fields and champagne color near the rim. The reverse has few marks, notable luster, and the same pleasing champagne color. The 20 reales of this type were issued from 1856 to 1864 at the Madrid, Seville, and Barcelona mints. As the primary store of silver among coins of Spain and possessing more silver content than most similarly sized coins of Europe at the time, 20 reales coins were heavily exported throughout Isabel's reign. Finding an appealing example is very challenging in any grade. AU examples are rarely seen and uncirculated examples are almost never seen. So scarce are these coins in eye appealing, problem free condition that coins with nice eye appeal which exhibit mild cleaning or small scratches are often acceptable to collectors. This particular coin exhibits soft, even wear on the highpoints of the obverse with luster peeking out from protected areas of the bust and letters of the legend. The reverse is well struck with significant luster remaining and only a few marks other than the scratches at 12 o'clock. The 100 reales of this type were issued from 1856 to 1862 at the Madrid, Seville, and Barcelona mints. This particular coin was minted in Barcelona as indicated by the 8 pointed stars at either side of the denomination on reverse. Mint frost can be seen in the hair and other aspects of the bust. Both sides are highly lustrous with a number of small marks throughout. The 5 céntimos de real were of a single type issued from 1854 to 1864 and all minted at Segovia. The coin pictured here exhibits beautiful red-brown surfaces with red iridescent luster in the reverse fields. The 2 reales of this type were issued from 1857 to 1864. This particular coin has brilliant luster with pleasing champagne toning. Certainly among the finest examples seen by this author. The 1 real coins of this type were issued from 1857 to 1864. This particular coin has lustrous mirrorlike fields with frosty devices and a hint of pleasing edge toning. Though small silver coins of this period are more readily available in XF condition or above than their larger siblings, this example is the closest to perfection that this author has encountered for the type. This particular coin has lovely surfaces with a hint of colorful toning in some areas of the date and legends on the obverse. Although the luster of the reverse is subdued, the devices are sharp.